At the end of January I spoiled myself with some treatments from Sorbet. The best part was I had a discount voucher. The beauty technician was right on time and extremely professional. I really needed a few hours to just chill. And that is exactly what happened. The lady was clever and did the waxing before the "lekker" treatments. Then came the good part. The lady dimmed the lights and left me to get ready for a hot stone massage. She was so nice and warmed up the bed with an electrical blanket. She gave me a few minutes to myself and to get ready in orivacy. The music was so relaxing and the massage was amazing. I wanted to stay in that room the rest of the day. When the massage was over it took me a few moments to come back to earth and get ready for a nice pedicure. I chose a beautiful red polish. They had these fancy leather chairs - oh so comfy. 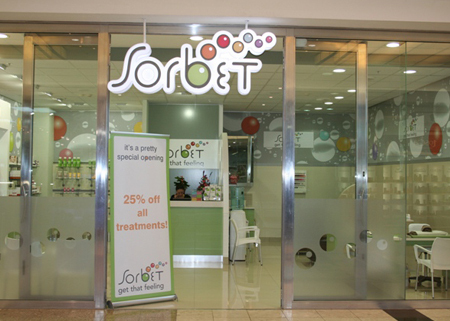 The few hours I spent at Sorbet was really relaxing and revitalizing. The thing I realized, is that you do not have to go to a fancy spa to get the same experience. Where do you go to spoil yourself? Leave me a comment below.